Hello there - I am new in Dungeon Quest! I just started to play Dungeon Quest last year and I already love this game! So many games nowadays had a system where you have to spend time every day and you always have to wait till you can play further. But Dungeon Quest… you play, when you want it and you dont have any obligations! I searched so long for a game like this! Maybe bad slime because he dont boost element? I am not following the “bad skill” question. Anyway you could provide a pic of your pet? I could just be misunderstanding what you are asking. 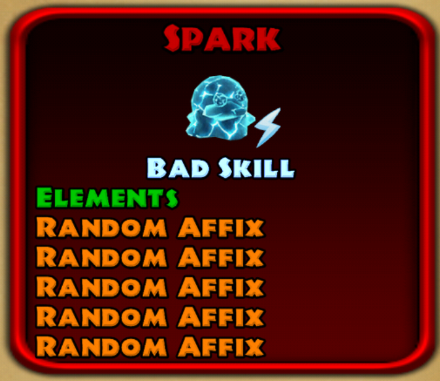 Hi welcome to this awesome game, I have the same reason too for loving this game, yeah regarding that too, the bad skill , I think it’s a random 10% boost on a random element, but what I’m concern is it’s set, elements on pets it says chance to apply the same skill with different element, then it has also the % increase in individual resist, but when I compare it when I’m equiped with slime or not the resists on the elements are the same theirs no increase on any elements happening. @Syhris & @tdaniel in the Codex, Bad Skill is a term that is used for the Special Skill or Talent of Trinkets and some Pets. I am sure you have noticed that some of the Slime Pets have Bad Skill and others have Boost Element (pick one Element). I think that when there was an update and a few Slimes were added to the list, the older ones were listed with Bad Skill, and the newer ones were listed with Boost Element. the Bad Skills for the Trinkets are Silence, Slow, and Root. when I was looking for information, I thought it was a totally different skill than what you see on the Trinkets and Slimes, but eventually I figured it out. this is the last Post in a Thread I started that resolves the mystery of just what is the Bad Skill? @Shield_Hero I have noticed that also, and sent in a Bug Report a long time ago. I recently did some more testing and there was still no noticeable increase in DMG or in the Resist of the Element. for the DMG, I was looking at both the DMG for Skills on the Stat Page and DMG done both in the Campaign and with a Test Dummy. +10% Element DMG for a specific Element doesn’t seem like much, but every little bit can help at higher floors, and quite a bit for new players lucky enough to get a slime with an Element they like to use. Just making sure we didn’t have an index reported incorrectly that replaced an affix with “< BADSKILL >” as in it could not read the correct affix and was displaying broken text in the window. @Syhris, was the Bad Skill you mentioned in the description of the Slime you found, or was where Boost Element would be, or part of the description you read in the Codex? So I think its just wrong in the codex. All slimes must have “Boost” as talent.